Cuirassiers, means heavy chivalry, that worn cuirass. 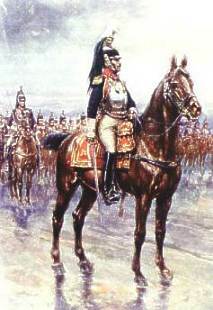 In Napoleonic times armed with heavy armour, helmets, straight sables (95 cm.) and pair of pistols. The only one regiment of cuirassiers in Army of Duchy of Warsaw (two squadrons) was formed by col. Stanisław Małachowski in Końskie on 1809. Till 1812 this regiment was in the Warsaw garrison. In russian campaign it lost bigger part of it (mostly at Możajsk) and practically his existence was finished. The leader of it was captured at Krasne. In 1813 there was restored one simple troop of cuirassiers (one squadron), that usually was the guard of Prince Józef Poniatowski.